The HW3000 Series Hook-Up Wire is a PVC insulated 300 Volt rated single conductor appliance wire with UL AWM 1007, UL AWM 1569 and CSA TR-64 ratings, and is ROHS compliant. It is tinned to minimize oxidation and is available as solid or stranded in multiple colors. 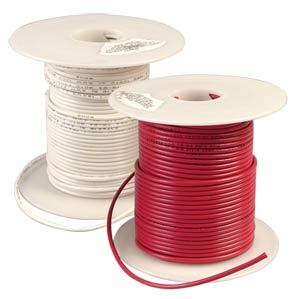 This PVC insulated hook up wire can be used within enclosed electronic equipment. Typical application include control panels, meters, computers, business machines and appliances where point to point wiring is required. * Specify color by entering color code from the chart. ** Specify Length “-100” or “-1000”.